Smithsonian Journeys engages travelers in the wide-ranging mission of the Smithsonian. Like the Institution, our tours enrich our guests’ lives and satisfy their curiosity about the world around them. Your participation benefits the work of Smithsonian’s 19 museums, National Zoo, and nine research centers, helping to preserve our national treasures and shape the future through science, research, and exhibitions. The expertise of a Smithsonian Journeys Expert, Tour Director, and local guides throughout the tour. All accommodations (based on double occupancy). All meals during the program (B-breakfast; L-lunch; R-reception; D-dinner). Wine and beer served with lunches and dinners. Enrichment program of lectures and special events. All on-tour transportation, unless otherwise noted. Taxes, service, and all gratuities. Airport transfers for those arriving/ departing on scheduled program dates. House wine, beer, and soft drinks with all meals. Passport fees, visas, and visa photos as required. Personal items such as wines, liquors, à-la-carte orders, meals other than specified. Transfers to and from airports for those not arriving/departing on scheduled program dates. Space is reserved in the order of receipt of phone or web reservations. To submit a request for a reservation, please order using our secure online process, or call 855-330-1542 to speak with a Cultural Travel Specialist, Mon-Fri 9 am - 7 pm; Sat 9 am – 4 pm (Eastern Time). For all international departures, passport information including the following, in accordance with the Transportation Security Administration’s (TSA) Secure Flight program as well as by our international travel partners: your full name as it appears on your passport, date of birth, and gender (for further information, please visit www.tsa.gov). In the event, an airline ticket is issued with incorrect information you have provided, or if you use a different passport than originally cited, you will be responsible for charges associated with the ticket’s reissue. Deposit of $500 per person, unless otherwise noted, is required to reserve a space on tour. This deposit may be made by credit card or check to Smithsonian Journeys and is applied to the final payment of the tour price. Any registration received within 120 days of departure is considered a “late registration” and must be subject to special confirmation. Smithsonian Journeys will process the credit card deposit of $500 per person, then payment in full must be made immediately by credit card, or by check sent by overnight mail to the tour operator before confirmation is possible. Cancellation and Refund Policy: Per person cancellation fees are based on date of notice to Smithsonian Journeys. Cancellation 7 days after booking: $500 retained. For tour packages that include round-trip international airfare, rates are based on economy class from designated departure cities as shown. Airfares from other cities are available upon request. Airline upgrades at additional cost may be available on request for the international portion of your flight. Since international and domestic air schedules are subject to change at any time, we recommend that if you choose to make your own airline reservations, you do not purchase nonrefundable tickets or those with high penalties for changes. Neither Smithsonian Journeys nor the tour operator has any liability for any loss resulting from tour cancellations or changes in international gateways, travel dates, or airline schedule changes. If an air schedule requires an overnight stay in a gateway city, the cost of the overnight will be at your expense. For tour packages that include round-trip international airfare, we will be happy to help with arrangements. Please note that seat assignment on your international flight is usually done at airport check-in. The tour operator is unable to guarantee any seat assignments. A designated group flight is not included on most tours. However, transportation from the arrival airport to the ship/hotel is included in your tour cost if you arrive in time to meet the scheduled group transfer. Your first tour bulletin will thoroughly explain the details of the options available for your individual flights. We urge you to check airline cancellation penalties before purchasing airline tickets since international departure times and flights can change. Tours also can be canceled due to low enrollments. Neither Smithsonian Institution nor the tour operator accepts liability for cancellation penalties related to domestic or international airline tickets purchased independently in conjunction with a tour. For the convenience of our travelers, Smithsonian Journeys includes an on-tour Provided Insurance Plan, through Travel Guard, with the price of your tour. On-tour emergency evacuation insurance (up to $100,000), medical expense coverage (up to $25,000), dental expense coverage (up to $500), travel medical assistance and worldwide travel assistance (U.S. Residents only). It also includes up to $25,000 medical and up to $500 dental expense coverage, and 24-hour worldwide travel and medical assistance. Please click here to view complete coverage details. Please visit www.TravelGuard.com/SmithsonianJourneys or call Travel Guard at 1-800-208-6142 to learn about additional (optional) coverage. 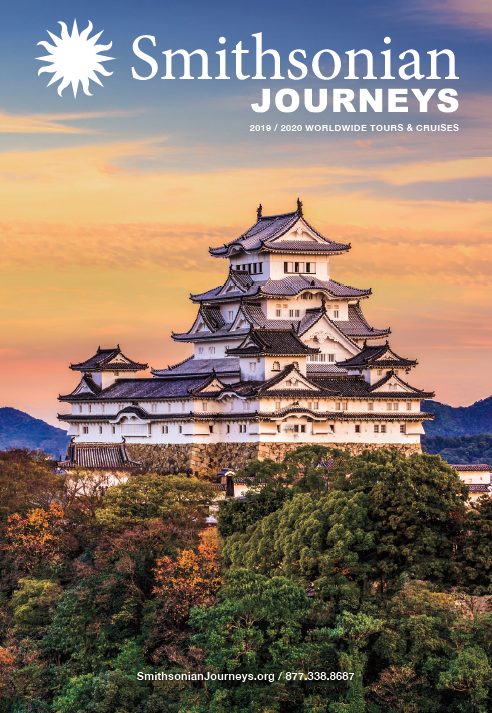 For all international departures, a passport valid for at least six months after the completion of your tour, and with at least six blank visa pages, is required for U.S. citizens on all tours in this catalog. If your tour requires a visa or other entry documents, we will send you the appropriate information after you make a reservation. You are responsible for obtaining these documents. If you are not a U.S. citizen, please contact your embassy or consulate to ensure you obtain the proper documentation. Please note that these tours require that participants be in good physical condition. You must be capable, without assistance, of walking a minimum of two miles over uneven terrain and of climbing stairs that may not have handrails. Participants should have sufficient stamina to keep pace with an active group of travelers on long days of touring. If you have any questions about your ability to participate in a tour, please call us at 855-330-1542. Some tours have additional notes regarding physical and medical considerations, which are noted on the Tour Information link. Smithsonian strives to improve tour itineraries and their features. If improvements can be made, or unforeseen circumstances beyond our control make changes necessary, we reserve the right to vary itineraries and to substitute hotels. Every effort will be made to carry out the program as planned but alterations may still occur after the final itinerary is sent. Please note that weather conditions may force changes to the advertised sailing schedule on cruise programs. The ship’s captain has the authority to change the ship’s schedule. Smithsonian chooses hotels based on a combination of their location, service, atmosphere, and price. On adventure tours and programs in out-of-the-way places, best-available hotels are used. In most cases, hotels have elevators and meeting rooms for Smithsonian lectures. Program prices are based on two persons sharing a room with a bath. Hotel rooms are always reserved for single travelers; however the number of single rooms available on a tour may be limited. Therefore we recommend that you register early. Please note that a single supplement will apply for a single room. If you are traveling alone and wish to share a room, we will do our best to find someone of the same gender and smoking preference to share with you. If you are matched with a non-smoking roommate, it is mutually agreed that you cannot smoke in your hotel room. When a roommate cannot be found, the single supplement will be charged. All tours, except family programs, are designed for adults. Some may be suitable for older children. Regardless of age, children must pay full price unless otherwise noted, and a parent or guardian must accompany those under 18. Participants may wish to extend their stay in the group hotel. Please note that the tour operator can assist you in making post-tour arrangements only. We regret that we are unable to help with pre-tour arrangements. Participants on tour may be photographed for the educational and promotional purposes of the Smithsonian Institution. Photographs may be printed in publications and posted on websites to promote Smithsonian Journeys. Travelers who prefer that their image not be used must advise the tour manager at the beginning of the tour. General information about the countries you will visit, e.g. the food, customs, medical precautions, and currency. Smithsonian Journeys are managed by professional tour operators hired as independent contractors. The use of tour operators allows the Smithsonian to offer its members a wide array of educational travel opportunities. The tour operator acts only as an agent for the respective suppliers by making arrangements for transportation, accommodations, and other services. Neither the Smithsonian Institution nor the tour operator shall be held liable for personal injury, death, property damage or accident, delay or irregularity arising out of any act or omission of these suppliers. The Smithsonian Institution and the tour operator reserve the right, without penalty, to make changes in the published itinerary whenever, in their judgment, conditions warrant, or if they deem it necessary for the comfort, convenience, or safety of tour participants. The Smithsonian Institution and the tour operator also reserve the right, without penalty, to withdraw the tour announced, to decline to accept any person as a participant in a tour, or to require any participant to withdraw from the tour at any time, when such action is determined by tour staff to be in the best interests of the health, safety or general welfare of the tour group or the individual participant, subject only to the requirement that the recoverable portion of the total amount paid that corresponds to the cost of unused services and accommodations be refunded, if any. If your tour does not include airfare, your Tour Bulletins will provide information about when participants are recommended to purchase airline tickets. The Smithsonian Institution and the tour operator accept no liability for the purchase of non-refundable airline tickets to/from the tour departure city if a tour is canceled or otherwise modified subsequent to the participant’s purchase of those tickets. Baggage and personal effects are at all times the sole responsibility of the participant. Dates, schedules, program details, and costs, although provided in good faith based on information available at the time of publication of the brochure or catalog, are subject to change and revision. The undersigned has read carefully the Responsibility Statement and Liability Disclaimer set forth above, the schedule of activities for this tour, as well as the terms and conditions of application and participation as set forth in the tour brochure(s), and recognizes and accepts any risk associated with the tour and the conditions, including the refund policy, set forth in the tour brochure(s). The undersigned further acknowledges that there are many risks and uncertainties inherent in any travel tour, including but not limited to the hazards of various modes of transportation, forces of nature, acts or omissions of foreign governments, terrorism, war or insurrection, theft, illness, and damage to person or property due to the negligent acts or omissions of tour staff or others. In consideration of, and as part payment for, the right to participate in the tour, the undersigned, on behalf of himself, his dependents, heirs, executors, administrators and assigns, agrees to release the Smithsonian Institution, its Regents, officers, employees, representatives or agents, the United States, and the tour operator and its officers, employees and agents, from liability for personal injury, death, property damage or loss suffered by any person in connection with this tour, even if caused by the negligence (but not the reckless, willful, or fraudulent conduct) of tour staff or other related persons or entities. In addition, by registering for this tour, the applicant certifies that he or she is mentally and physically capable of full participation in this tour. By registering for a Smithsonian Journey, the participant agrees to the Responsibility Statement and Liability Disclaimer and the Terms and Conditions herein.